I have a major sweet tooth. Over the years I have tried numerous times to give up sugar without much success. Now in my mid thirties I have resigned myself to the fact that while I hate salt I love sugar. Potato chips and salted treats do nothing for me. I literally could sit with salty snacks in my cupboard for months. Sweet treats on the other hand call my name. I love them. Since I know that sweet treats are a serious temptation for me I have learned over the years that denying myself only makes matters worse. To stay thin I allow myself treats ever week in moderation. Denying myself completely just makes me want to eat the entire cake instead of a small piece. As I age closer to 40 I have also discovered that it takes a lot more work to stay thin so I have modified my diet to try to include as many natural foods as possible. In the last month I have tried to start swapping out granulated sugar for honey and molasses. The flavor is still there, but I can reduce the overall amount of sugar needed and it doesn't cause me the same amount of sugar highs. Yesterday I tried a new recipe for Peanut Butter Chocolate Chunk Cookies from the January 2013 issue of Family Circle magazine. This recipe has 12 ingredients. It takes 28 minutes of total time, 15 minutes of which is active and makes 28 cookies. I did make a number of modifications to this recipe. First instead of using 1/2 cup of butter I substituted 1/2 cup of canola oil. I am trying to reduce the amount of butter that I am baking with and this was an easy substitution. Secondly, instead of the 1/2 cups of granulated sugar I used 1/2 cup of honey. For the 3/4 cup of brown sugar I used slightly less than a 1/2 cup of molasses, so between the honey and molasses I had approximately a cup of liquid. Since I increased the amount of liquid by using honey and molasses I added an additional 1/4 cups of brown rice flour. I eat gluten free so I omitted the all-purpose flour and used equal amounts brown rice flour instead. My baking time was slightly longer than the recipe since I made substitutions, approximately 5 minutes per batch. For gluten free cookies these rose very well. Oftentimes gluten free desserts end up flat, but these did a great job of baking up. My husband actually thought they were a little too cakey, but my two boys and I liked the texture. I liked the peanut butter, but I wasn't a big fan of the chopped peanuts. I think if I made the recipe again I would leave them out as an ingredient. These look so yummy! I am the same way with sugar. I've tried to give it up, but I never can shake it for more than a week. I just try to eat sweet treats in moderation so I don't go crazy! Glad that I'm not alone :) I have tried many times unsuccessfully to give up sugar! Hi. I have never tried giving up sugar. We are long-time friends. I know it - no need to fight it. I've used several substitutions also. I've never tried molasses, though. Thank you for the suggestion. I am happy to let you know that you are going to be this week's Featured Read on the Thumping Thursdays Blog Hop. Thank you for joining us. It's good to have you. Thanks for the feature, I really appreciate it! I have tried a number of sugar substitutes too, honey and sorghum are my favorites! Now you're speaking my language. 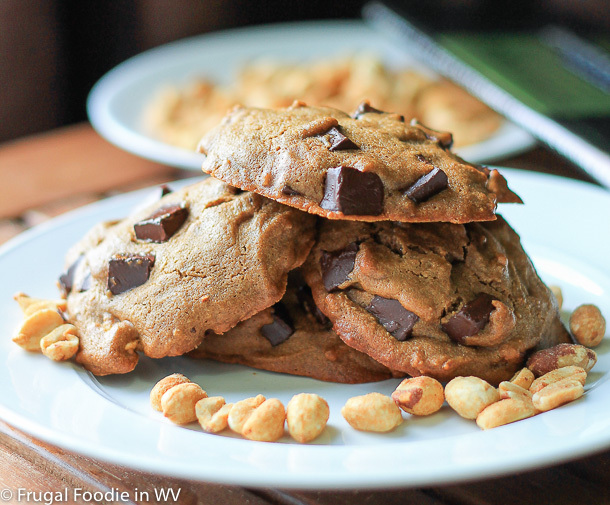 Peanut butter cookies are my favorite of all time - and then with chocolate chunks = heaven! I love peanut butter cookies also, yum! Those look delicious!! I love pb and chocolate cookies! I found you through the Doing YOU WELL link up and I am a new follower. I hope you have a great day! Followed you back :) I love peanut butter and chocolate cookies also! Thanks :) I love peanut butter and chocolate cookies also, they are delicious! OMG! I want these now! I am the same way. Can't resist those cookies!